ATEC has assembled an exemplary reputation in the industry with global operations executed from key international business locations in the Americas, Middle East and Asia. ATEC employs a highly effective workforce offering a wide range of services not only to the drilling contractor and production market, but also skill sets and experience, working in the renewable and construction market. We provide inspection, engineering, fabrication, training and maintenance services for an ever-changing industry. ATEC is accredited to and maintains ISO 9001 quality certification standard from DNV Quality Evaluations Incorporated, and is approved as a service supplier by both ABS and DNV. We treat each other, our customers and vendors with appreciation, commit ourselves to the highest standards of integrity and create a culture of continuous improvement. 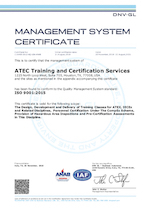 ATEC conforms to the Quality Management System standard ISO 9001:2015, that includes The Design, Development and Delivery of Training Classes for ATEX, IECEx and Related Disciplines, Personnel Certification Under The CompEx Scheme, Provision of Hazardous Area Inspections and Pre-Certification Assessments in This Discipline. We are one of the first companies in the world to utilize blockchain for storage, further enhancing the value of our certification. Based on a network of computers that all must approve an update; it reduces the dependency and vulnerability of a centralized data storage.